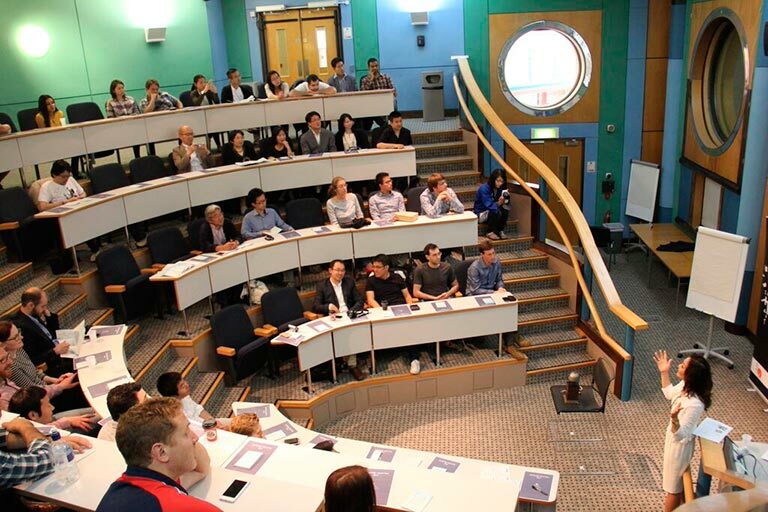 On June 28th, 2015, Cambridge Japan Day 2015 was successfully held at Cambridge Judge Business School (JBS) with more than 60 participants. 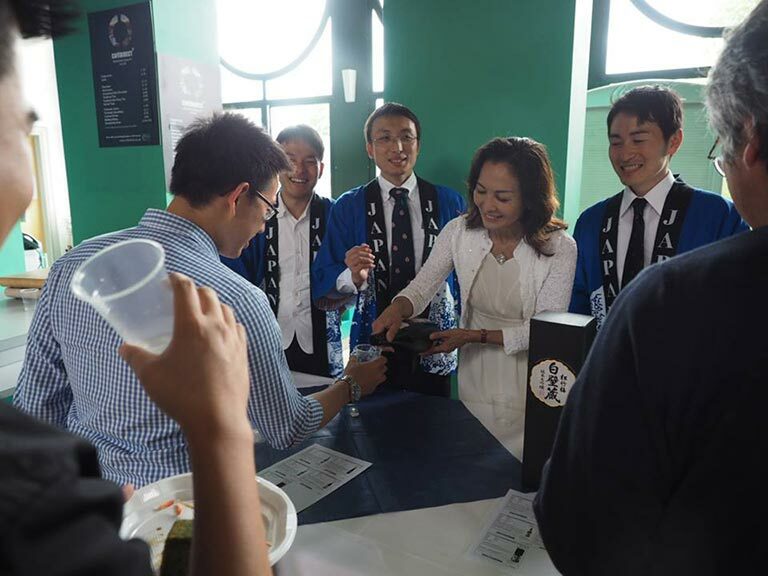 The event was the first Japan Day at JBS and was arranged by a team of Japanese MBA students: Masayoshi Yoshihara, Shingo Matsuba, and Tomoaki Goeku, aiming to promote “Cool Japan” in cooperation with Sake Samurai UK and Tazaki Foods UK. The event started with a lecture, Changing Times? Adventures in Corporate Japan by Dr Simon Laurent, which explained “Wadokei” (a Japanese clock) and led to a discussion about the culture of Japanese corporations and their future challenges. The next lecture was conducted by Rie Yoshitake from Sake Samurai UK with a title of SAKE; Introduction of Japan’s national drink. Rie gave an introduction to Sake and common misunderstandings among foreigners and also explained its deep cultural roots related to the spirit of Japanese people. 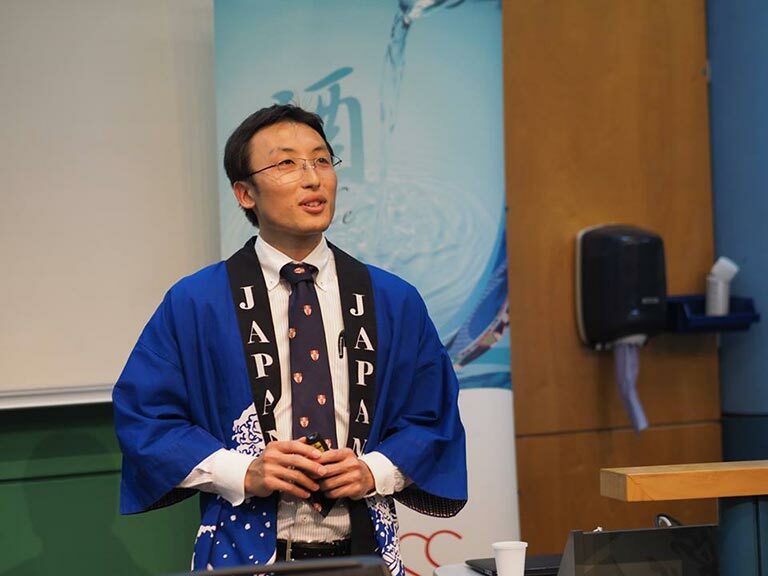 The lecture was followed by a Sake tasting sponsored by Sake Samurai UK and Tazaki Foods UK. 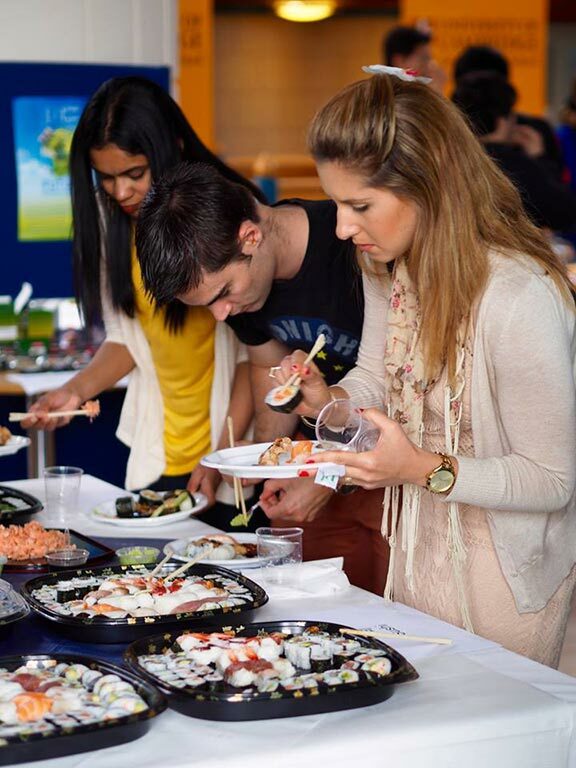 Although Sake has already become popular in the UK, many attendees found the tasting a new and exciting experience. A large selection of sake from across Japan in various types were served and all were well received. Umeshu and Junmai Daiginjo turned out to be especially popular among the attendees. Japanese food such as Sushi, Okonomiyaki, and Macha Cake were served together with drinks. Tazaki Foods UK’s Yutaka brand products were also offered to the attendees. After Sake and food, Wataiko, a traditional Japanese drum, was performed by Kumiko Suzuki from the Sounds of Japan. Kumiko introduced the sounds and rhythms of Japan and even let the audience play her drums, which was exciting for the audience and enjoyed by children. The Japanese organisers also participated in a performance by World Order, a cool Japanese dance unit, which represents systematic and uniform character of Japanese culture. Hibiki Ichikawa, the only professional player of the Japanese string instrument Tsugaru Shamisen in the UK, ended the event with his performance. He taught the audience some basic knowledge about Tsugaru Shamisen and covered musical styles from traditional to modern. Every attendee embraced this exposure to Japanese culture and seemed to be well satisfied. The event was concluded by Ipponjime, one of traditional ways to close a formal party in Japan. The Japanese organisers said, “The excitement of attendees were more than we expected. We would like to share the success of the event with next Japanese MBA students and hope this event will continue in the future”.